In the beginning of The Schlemiel as Modern Hero, Ruth Wisse points out that for Rabbi Nachman the Simpleton (that is, the schlemiel) acts “as if” good will triumph over evil. In his story, “The Clever Man and the Simple Man,” the thinker looks down on the simpleton as an idiot for being so naïve. The simpleton’s honesty and trust are the object of his ridicule. In many ways, Rabbi Nachman suggests that the simpleton, like many wise men, is a mystic in disguise. And for Rabbi Nachman, as well as for many Yiddish writers who followed in his wake, the schlemiel was a character whose simplicity and trust pose a challenge to the skepticism and deceit of a world that laughs at him. But, in the end, it’s the schlemiel who has the last laugh. I recently came across an aphorism by Friedrich Nietzsche that contrasts philosophers to mystics. 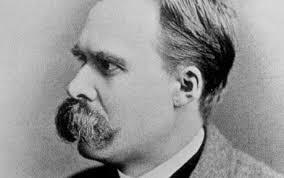 The contrast is brief and Nietzsche spends far more time – as one can imagine – making fun of philosophers. The resonance between Nietzsche and Rabbi Nachman, at least in this aphorism, gives food for thought. But would Nietzsche act “as if” good would triumph over evil, or is his mystic “beyond good and evil” and beyond acting as if “good exists?” Wouldn’t that be too….”stupid” for him? Nietzsche starts his fifth aphorism by noting that “one regards philosophers half mistrustingly and half mockingly.” Why? It isn’t simply because they are “innocent…fall into error and go stray, in short their childishness and childlikeness.” Rather, it is because they “display insufficient honesty while making a mighty and virtuous noise as soon as the problem of trustfulness” is invoked. In contrast, Nietzsche tells us that “mystics…are more honest and more stupid to them.” In saying this, Nietzsche privileges honesty and stupidity over dishonesty and feigned intelligence. Kant…lures us along the dialectical bypaths which lead, more correctly mislead, to his ‘categorical imperative’ – this spectacle which makes us smile. How much personal timidity and vulnerability this masquerade of a sick recluse betrays! In other words, Nietzsche sees their arguments in the name of morality as the product of sickness. They act “as if” they are defending the truth and this act is, for Nietzsche, worthy of a laughter that looks to purge the sickness of the philosophy in the name of health. But what does Nietzsche mean by health? Is his health closer to that of the “honest” but “stupid” mystic? Or is health equated with a kind of intelligence that refuses both the philosopher and the mystic? To be sure, schlemiels and mystics aren’t sarcastic. This act, as Ronell suggests, is an intelligent act of “ironic self-destruction.” There isn’t a relationship with the “as if” of goodness, as there is with the schlemiel. Moreover, while the schlemiel is blind to the abyss, Nietzsche is not. The schlemiel doesn’t laugh, Nietzsche does. And this laughter, I would argue, is the laughter of a metaphysics which, through laughter, elevates the subject of laughter beyond the philosopher and the mystic. It is, for Nietzsche, the most “honest” laugh of all because it is beyond good and evil. But it isn’t stupid; it’s critical. In contrast, the laugh that the schlemiel evokes is sad laughter. It is not beyond good and evil so much as caught between them. Being on the other side of history, Jews couldn’t afford to laugh in the way Nietzsche could. And this is reflected in the schlemiel who, though committed to goodness, fails in a world that disregards the good.